Menkaure's eldest son by Khamerernebty II, Prince Khuenre, did not succeed him, presumably because he predeceased his father. A small stone statue in the Boston Museum represents the prince in the squatting position of a scribe, kilt stretched between his knees to support his writing board; this was to become the classic pose for scribal statues of nobles in the next dynasty. 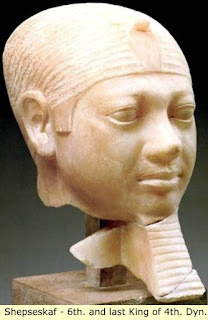 Instead, the king was followed by Shepseskaf, another son by an unknown queen. His was a short reign of only four years. The fortunes of the kings of the 4th Dynasty were on the wane after Khufu's magnum opus, and began to slide rapidly downhill towards the end. This is very evident in Shepseskaf's monument. He moved away from the Giza plateau, returning to the old 3rd Dynasty burial ground at South Saqqara where he erected a most curious tomb. Known as the Mastaba el-Faraoun (Pharaoh's Bench), it originally had the shape of a large rectangular sarcophagus but is now much denuded. His half sister, Khentkawes (daughter of another unknown queen of Menkaure), chose to have a similar style monument, but hers is back at Giza. She married Userkaf who became the first king of the next dynasty.